IBASSIN: 2017 BASS Elite Lake Dardanelle Day 1: Kevin Van Dam Leads with 19-03lbs! 2017 BASS Elite Lake Dardanelle Day 1: Kevin Van Dam Leads with 19-03lbs! With $100,000 and valuable Toyota Bassmaster Angler of the Year points on the line, VanDam fully understands what's at stake. But even the seasoned veteran was surprised at today's results. "I've had mixed results on Dardanelle. I got second to Mark Menendez in 2009, and had a terrible tournament in 2014," VanDam said. "But I know the bass in this lake move around a lot, which makes staying consistent difficult sometimes. I'm actually very pleasantly surprised with my weight today, and the rest of the field did better than I had expected." "I caught two big fish that really helped," he said. "I learned some things today, but on Dardanelle you can't always bet on a pattern holding — you have to stay flexible. I don't believe the forecasted storms will have much impact on how and where I'm fishing, but duplicating today's weight would surprise me again." "I feel like I know what I need to look for under these conditions," he said. "After I had a limit, I spent a lot of time running around and practicing for the coming days." 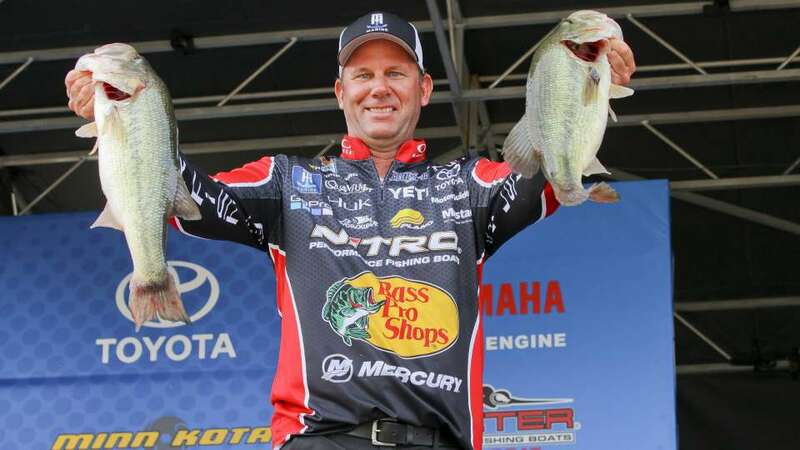 "This lake can be stingy, but catching that big one today really helped set me up for a strong start," DeFoe said. "Over the years I've learned that after several times through an area, the biggest fish will often come from a spot I've already fished," he said. "Never leave biting fish." Tim Horton of Muscle Shoals, Ala., won the second Elite event of the 2017 season at Florida's famed Lake Okeechobee, and he'll be starting Saturday's second day of competition in third place after weighing 18-7. "I feel pretty good about what I'm doing," Horton said. "The weather forecast is calling for rain over the next couple of days, and I think it could help me. My better bites happened this morning when it was cloudy, and I hope I can keep that pattern going. Saturday's second round of competition will resume with takeoff at 6:15 a.m. CT at Lake Dardanelle State Park. Weigh-in will occur in the same location at 3:15 p.m.